ABOARD THE PAPAL FLIGHT FROM CAIRO – A diplomatic solution must be found to the escalating tension between North Korea and the United States, Pope Francis told journalists. “The path (to take) is the path of negotiation, the path of a diplomatic solution,” he said when asked about U.S. President Donald Trump’s decision to send Navy warships to the region in response to North Korea’s continued missile tests and threats to launch nuclear strikes against South Korea, Japan and the United States. 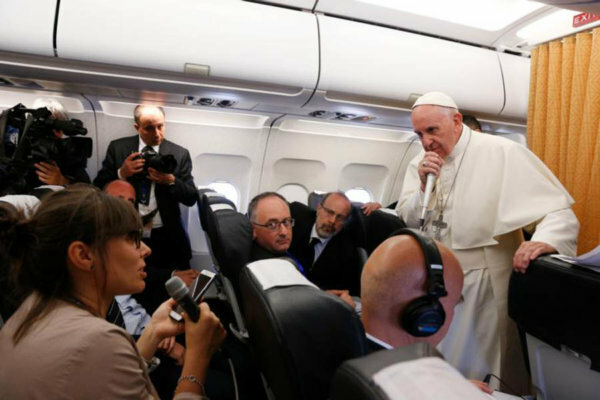 “What do you say to these leaders who hold responsibility for the future of humanity,” the pope was asked, during a Q-and-A with journalists on the flight to Rome April 29 after a 27-hour trip to Cairo. “I will call on them. I’m going to call on them like I have called on the leaders of different places,” he said. There are many facilitators and mediators around the world who are “always ready to help” with negotiations, the pope said. “I always call (for) resolving problems through the diplomatic path, negotiations” because the future of humanity depends on it, he said. Pope Francis said his contention that the Third World War already is underway and is being fought “piecemeal” also can be seen in places where there are internal conflicts like in the Middle East, Yemen and parts of Africa. A journalist with German media asked the pope about the controversy he sparked April 22 for saying some refugee camps are like concentration camps. “For us Germans obviously that is a very, very serious term. People say it was a slip of the tongue. What did you want to say?” the reporter asked. When centers are built to lock people up, where there is nothing to do and they can’t leave, that “is a lager,” he said, referring to the German term for a concentration camp. Another reporter asked how people should interpret his speeches to government officials when he calls on them to support peace, harmony and equality for all citizens, and whether it reflected him supporting that government. The pope said that with all 18 trips he has taken to various countries during his pontificate, he always hears the same concern. However, when it comes to local politics, “I do not get involved,” he said. When asked if he had had a chance to run off to see the pyramids, the pope said, “Well, you know that today at six in this morning two of my assistants went to see” them.